William Powell was the husband of Sarah Elizabeth Powell of Victoria Terrace. William was buried at St. Matthew’s on 12th November 1918 and was granted a Commonwealth War Graves Commission memorial showing that he had served in the Royal Welsh Fusiliers. William is not listed on either the Hawkesbury or St. Matthew’s memorials. 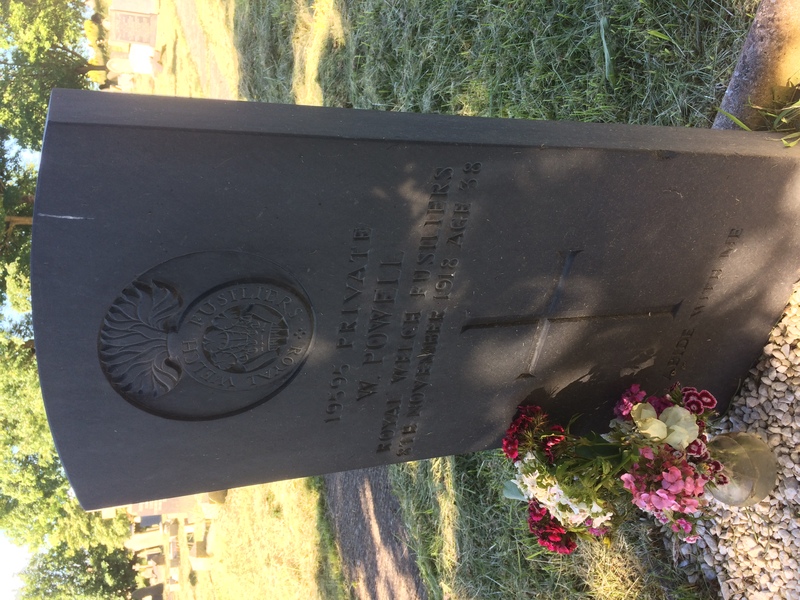 William Powell enlisted 5th January 1915 in the 16th Btn. RWF, and was discharged 3rd February 1915 after service of 30 days due to heart valve disease and tachycardia. He was 31 and employed as a brickmaker. The discharge paper was noted “not likely to become an efficient soldier”. His attestation noted that he previously served in the RWF (the record is not clear if he served 5 years or if he was in the 5th Btn., or both). His address was 19 Mount Terrace, Lane End and his wife was confirmed as Sarah Elizabeth Tudor. They were married at the Register Office Hawarden, 15th Oct 1910, and they had a child, Eveline, born 1st April 1914. William is remembered with a commemorative stone next to the family grave at St. Matthews.